It’s been a couple of months now since Ron Dennis disappeared on gardening leave, whilst his back has been turn Zak Brown has been ringing the changes to make McLaren a better prospect and more marketable. 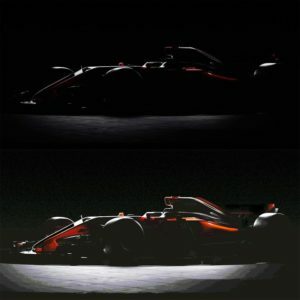 The teasers coming from McLaren seem to indicate a return to an papaya orange livery – just like the McLaren’s of old before Marlboro’s red and white colours defined the team image. Over night @TheJudge13 has posted some ‘leaked spy shots’ apparently showing a very different McLaren with plenty of orange. Could this be a real leak? Or a speculative render? “I don’t mind admitting that it feels a bit strange to be announcing that I’m moving on from McLaren, the company to which I’ve devoted almost all my professional life. But now is the right time. “However, I’ll continue to work on the projects with which I’m already engaged, and I expect to formalise my departure some time in late March. “Over the past 35 years I’ve worked with some truly brilliant people, and I want to say thank you to them all. Our successes were a team effort in the most fundamental way. “Whatever Ekrem chooses to do with the rest of his professional life, I’ll always regard him as a McLaren man through and through. His commitment and work ethic remain absolutely second to none, and I feel privileged to have worked with him for so long – not only recently as his McLaren colleague but also, over many years, as his close associate, during my time at Just Marketing International. “Ekrem and I achieved a lot together, and I don’t mind admitting that I learned a hell of a lot from him. His commitment to the McLaren cause has never wavered, and you’d have to look very hard to find a man who works harder than he does. “I’ve known Ekrem for 34 years – and, from the moment I first met him, I recognised in him a first-rate commercial mind and an unbelievable determination to succeed. “Those early days were stressful but exciting – and, when we began to achieve world championship successes in the mid-to-late ’80s with the likes of Niki [Lauda], Alain [Prost] and Ayrton [Senna], inevitably it was our superstar drivers and our brilliant engineers who seemed to get the lion’s share of the credit. But, behind the scenes, Ekrem’s clever but dogged commercial work was just as important. Again and again it was Ekrem who would successfully capture the valuable sponsor-partnerships that our rivals so coveted, and as a result we were able to fund the car-development programmes that enabled us to win and win and win again. “Since the Bahrain Mumtalakat Holding Company first purchased a McLaren shareholding 10 years ago, which event signalled the commencement of my involvement with the company, I’ve always been very impressed by the unique combination of quiet dignity and intense focus that has characterised the way Ekrem has led McLaren Marketing. “I echo the generous and accurate comments made by both Mansour and Zak, and I would like to add one final thought. Ekrem leaves McLaren Marketing in very good shape, its staff well set to continue to follow the example he’s set so diligently for so long. Lastly Honda have confirmed a risky strategy of having a completely new power unit this year, taking their concept in a completely different direction. This they have agreed is a big risk but you certainly have to take risks to challenge for the wins and podiums that McLaren desperately needs. Eric Boullier believes that the team could definitely be ‘dark horses’ this year and spring a surprise. With only ten days until testing begins, it all remains to be seen! The New Haas LEAKED PICTURES! Previous story Toro Rosso Goes Sugar Free?